Guided Report Mode is available in HTML Composer to help in the creation of a companion page for a Guided Report created in a tool, such as Report Painter. You can use HTML Composer to create a streamlined, highly parameterized report procedure that results in the ability to generate thousands of reports. Note: The Generate Graph and Add Filter right-click options are unavailable when using a guided report. With the HTML folder highlighted, select New from the File menu, and then select Guided Report Form. Right-click the HTML folder, and select New, and then Guided Report Form. 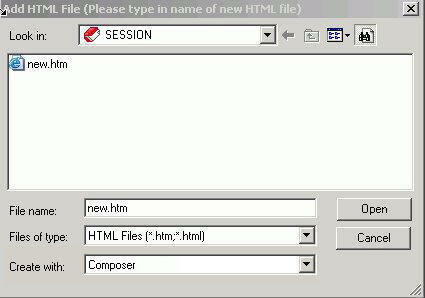 The Add HTML File dialog box opens, as shown in the following image. The Template Selector window opens. To create a Guided Report Form without using templates, select Cancel. For more information on using templates, see Using Templates in HTML Composer. Note: If you select Cancel, the page is created without templates but is still in Guided Report Mode. To create a Guided Report Form with a RIA theme, you must select Cancel from the Template Selector window. The following procedure describes how to operate in Guided Report Mode while using a predefined template. For more information on templates, see Using Templates in HTML Composer. Open HTML Composer in Guided Report mode, as outlined in How to Access Guided Report Mode. To create a Guided Report Form using a template, you cannot cancel the Template Selector. For more information on creating a Guided Report Form without templates, see the How to Create a Guided Report Form Without Templates manual. You can import an existing report, invoke Report Painter to create a report, or reference an existing procedure. Note: When you embed a report, once the Master File is selected for the first report, you will not be prompted for the Master File again when creating subsequent reports. All joins, defines, WHERES, includes, and stylesheets are copied to the component. You cannot invoke Procedure Viewer or Document Composer from the right-click menu while in Guided Report Mode. For more information about creating a Guided Report, see Creating Reports With Report Painter . After you embed or import the report, the New Parameters dialog box appears. You can chain the controls, select which parameters to create a control for, and change the Control Type. 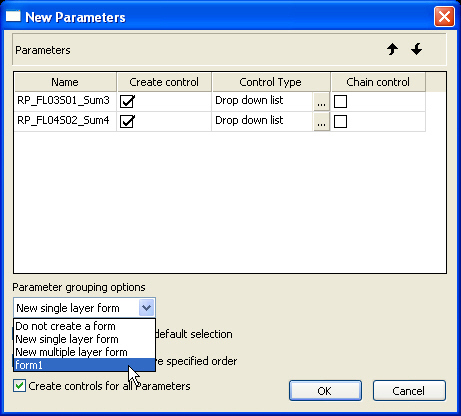 For more information about the New Parameters dialog box, see New Parameters Dialog Box. Make the desired changes and select OK. Import an existing report, invoke Report Painter, or reference an existing procedure for each additional Report or Chart frame. Since you picked a Master File for your first report, you will not be prompted for one again if you embed the report. The New Parameters dialog box appears and the parameters for each additional report are added to the form. You can reorder the controls, change the number of columns in the form, and hide elements by changing the display property according to the rules dictated by templates. For more information on these procedures, as well as allowed functionality while designing in a template, see Using Templates in HTML Composer. Open HTML Composer in Guided Report mode, as outlined in How to Access Guided Report Mode. To create a Guided Report Form without a template, you must cancel the Template Selector. For more information on creating a Guided Report Form with templates, see How to Create a Guided Report Form Using Templates. You can import an existing report, invoke Report Painter, or reference an existing procedure to create a report. Note: When you embed a report, once you select the Master File for the first report, you are not prompted for the Master File again when creating subsequent reports. All Joins, Defines, WHEREs, Includes, and stylesheets are copied to the component. You cannot invoke Procedure Viewer or Document Composer while in Guided Report Mode. After you embed, import, or reference the report, the New Parameters dialog box appears. You can chain the controls, select which parameters to create a control for, change the Control Type, and choose where to insert the controls. Make the desired changes and select OK. For more information on the New Parameters dialog box, see New Parameters Dialog Box. Embed, import, or reference the desired amount of Report or Chart frames. For each report added, the New Parameters dialog box appears. Optionally, you can change the style and layout of the Guided Report Form, as desired. You also have the option to use RIA themes or the standard color schemes, but not both. For more information on RIA themes, see RIA Overview. A page with controls for the Guided Report appears so you can customize and run different versions of the report dynamically. When you import, embed, or reference reports into a Guided Report form, the New Parameters dialog box opens, as shown in the following image. You can reorder the parameters. Moves the selected parameter in the corresponding direction. 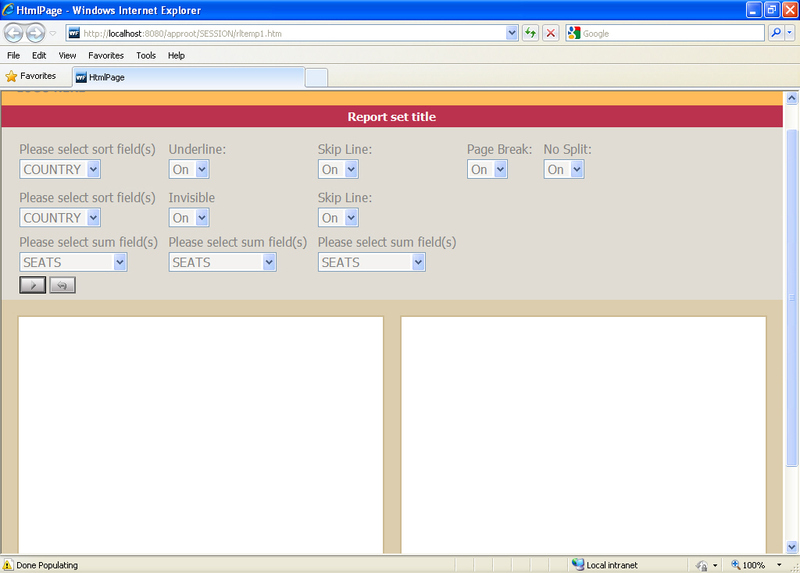 Displays the name of each parameter that you add to the Guided Report Form. Inserts a control onto the form for the corresponding parameter. By default, all parameters have the Create Control check box selected. Sets the control to be chained in the order they are listed in the New Parameters dialog box. The drop-down box also lists the names of any existing forms and you can select that option to add the new parameter controls to an existing form. Note: This option is only available when creating Guided Report Forms without using templates. Sets the New Parameters dialog box to off and instead, uses the default selections. 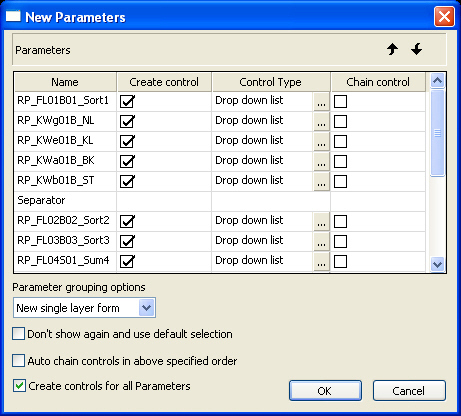 Selects the Chain control check box for each parameter. Selects the Create control check box for each parameter. Note: After the options for each fieldname control, a Separator is automatically added to generate a new line. There is also an extra separator added at the bottom of the parameters list that can be used to add additional spacing, as needed.